A young mother will spend the rest of her life in a wheelchair after catching a serious infection from using her best friend’s make up brush on a pimple. Jo Gilchrist, 27, was left writhing in pain on Valentine’s Day when a staph infection invaded her body and eventually attacked her spine. She has been in Brisbane’s Princess Alexandra Hospital ever since and doctors are still desperately trying to rid her body of the bacteria. 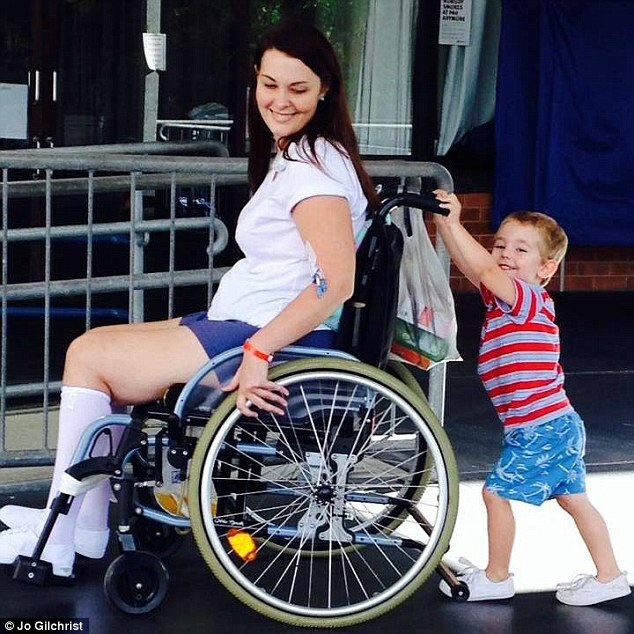 ‘It started as a little ache in my back and I thought it was my bad posture, but it kept getting worse and worse,’ Ms Gilchrist told Daily Mail Australia. The mother of one says it took doctors a long time to work out what was wrong and her body started to go numb and she lost feeling in her legs. ‘They said (the numbness) would go all the way up my arms and into my chest and when that happened I’d have to be put in an induced coma and learn to breathe again,’ she said. Ms Gilchrist was airlifted from her country hometown of Warwick to Brisbane where she underwent emergency surgery. When she woke she learned she had contracted community-associated MRSA – an antibiotic-resistant form of golden staph. ‘The only thing we can put it down to is the make up brush,’ Ms Gilchrist said. ‘My friend did have a staph infection on her face and I was using her brush just before. I had no idea that could even happen, I used to share with my friends all the time. Ms Gilchrist was told the infection had damaged her spine so severely she would never walk again and would be confined to a wheelchair. ‘They told me at my bedside that I’d never walk again and I just felt numb and I had tears rolling down my cheeks,’ she said. ‘But I’m fighting this with all I’ve got and I’m starting to learn to walk again. Two weeks ago they said I might be able to walk for an hour or two a day – like grocery shopping, washing up and hanging the washing out. Ms Gilchrist has lost all feeling below her belly button and will never have control over her bowel or bladder. Doctors are still administering high strength antibiotics to rid her body of the infection and she will spend another three months in hospital before she is cleared to return home. ‘I was so lucky it went to my spine… if it went to my brain I would have died and if it went to my limbs they would have been amputated,’ she said. She is now being taught how to adapt to life in a wheelchair so she can live independently and care for her two-year-old son Tommy. ‘It’s hard for him because he doesn’t understand. He is living with my family at the moment, which is two hours away, but he loves coming to visit,’ she said. As she focuses on her long recovery, Ms Gilchrist’s friends have also been busy with their own project. They have bombarded her favorite musician Seth Sentry with requests to visit her in hospital and even started the hashtag #jolovessethsentry to catch his attention. 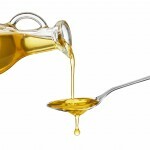 How To Get Rid Of Shingles Naturally?